Kid's Birthday Parties: How Much is Too Much? My own birthday parties were always fun. The best one I had was in second or 3rd grade. My mom took everyone to the park by the river in our town. There was a simple wooden stage set up there for park festivities and plays. Everyone had to get up on stage and perform a song or dance or tell a joke. We all laughed and acted goofy, and it was great. I also remember that one year my Mom used candles on my cake that looked like clown heads, and that freaked me out. Other than that, I can't remember much about birthday parties. Birthday parties today are very different from what I can tell. It seems that parties are taken to a new level. I think Moms put a lot of pressure on themselves to make their child's birthday party an affair to remember. 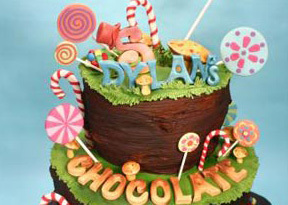 Custom cakes, prizes, gift bags, elaborate themes, and expensive decorations seem to be the trend. Where did all of this come from? I can't remember ever getting a goody bag at a birthday party when I was a kid. Did you know there are professional kid's party planners? Just looking at that website stresses me out. In a previous post, Crystal addressed how crazy wedding planning has become. Everyone treats their wedding like it's the Vanity Fair Oscars after-party these days. Kid's parties are going the same route. The question is, will kids even remember these over the top parties their parents are dipping into their 401K to throw? I have a couple of years before my own child will be having birthday parties where his friends will be invited. My main concerns will be that everybody has fun, feels included, and gets their frosting fix. I wonder if the trend will have reversed by then, and parents will have simpler parties. I doubt it! In a few years, perhaps parents will be flying their child's friends to Disney World for a private tea party with Minnie Mouse. Wait, that sounds kind of fun, doesn't it? At least I have a few years to save up! Have you thrown an elaborate party for your child? Has your child attended an over the top birthday party? What do you think about expensive kid's parties?